There is a idle adjustment on the front end of the carb. I would try adjusting that a bit. The Zeniths are good, reliable carburators. Kits are readily available for them. Generally though, like a good ol MS carb they just need a good cleaning. Bad gas, you know? I open them up and use a torch tip cleaner to clean all the jets, etc then blow them out good. If you are careful on disassembly you can reuse the gaskets. 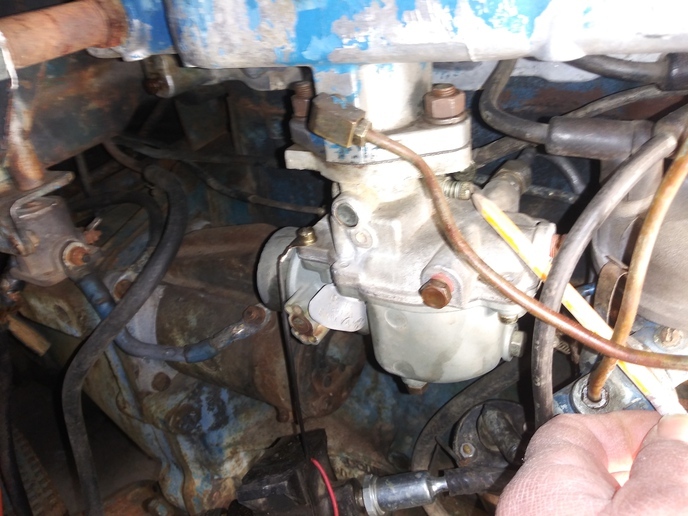 The Holleys that were originally on the 3 cyl tractors were actually a better carb. They used a vacuum controlled "Economizer valve" (think accelerator valve) which made them very efficient. Trouble is the bore that the EC slides in were made of pot metal and after 50 years are worn and not replaceable. They are rather complicated and cold blooded too. If you are a Good carb man you can sometimes get them to work ok. I'm not so I usually pretend I'm Tom Brady and give them my very best heave into the nearest swamp, dumpster or scrap pile. Be glad you have a Zenith. A new one costs about $450! They use more fuel but will make your tractor RUN. If the photo doesn't show click the link.